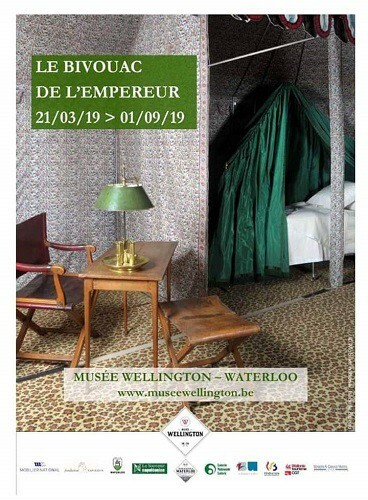 Napoleon’s “Garde-meuble” is on display at the Wellington Museum in Waterloo from 21 March to 1 September, campaign tents, luxurious portable furniture and clever objects that were designed and made for the Emperor to take wherever he travelled, whether in war or in peace. The exhibition is completed by iconographic documents, pictorial works and patents related to the creation of these objects. In collaboration with the Mobilier National, and the manufactories of Les Gobelins, Beauvais and Savonnerie, supported by several loans from the Fondation Napoléon Collection. Napoleon I was a great traveller. Even when he was on military campaigns, the Emperor was accompanied by objects that were worthy of his rank. Every time he set up camp, he was accustomed to being surrounded by luxurious (foldable) furniture and sophisticated accessories. The Garde-Meuble Impérial, predecessor of the Mobilier National, was the guardian of these objects. The Maison de l’Empereur, for its part, was responsible for maintaining the proper habits and etiquette of the imperial palace. In order to prevent accidents while travelling, these costly and finely-crafted pieces of furniture and equipment that accompanied the Emperor on his travels were generally protected by specially-made transport cases, which were themselves also beautifully made. The furniture for Napoleon’s “bivouac” needed to combine both practical considerations (in order to withstand constant manipulation) as well as comfort and refinement with a corresponding choice of materials.